Tim Murray sent a shockwave through the league in executing a seven-player deal to acquire Evander Kane earlier today and kept his phone hot later in the day as he capped his trading frenzy by sending Jhonas Enroth to Dallas. Enroth has been far and away the best goaltender on the Buffalo roster this season, there is no debating that. He’s managed to post respectable numbers despite playing on a historically terrible puck possession and defensive club. He also is set to become a free agent this summer and represented one of the many tradable assets on Buffalo’s roster. Despite Enroth’s strong play (at times) and the relatively weak play of Michal Neuvirth, it was hard to fathom trading one of the few players who had been performing well this season. However, Tim Murray did the right thing for the direction of the rebuild by moving Enroth for a third round pick and Anders Lindback. For all intents and purposes, Lindback is simply a throw in for this deal. Trading him gets him out of Dallas and keeps their depth chart intact. He also allows the Sabres to maintain the status quo as it pertains to their goaltending depth chart in Buffalo and Rochester. I’m sure Lindback will see a few games in a Sabres sweater this year, but the majority of Buffalo’s 27 games will belong to Neuvirth. The only real value in this deal is the 2016 third round pick the Sabres acquired. With the condition focused on Enroth winning at least four playoff games, it seems safe to assume that this will indeed remain a third round pick. Even with the condition included in this trade, I would have been very surprised to see Murray get anything more than a third for Enroth. Even with Henrik Lundqvist’s recent injury, the market for a goaltender is incredibly thin. The Rangers have made it clear that they want a veteran backup to slot in behind Cam Talbot, not a player who will challenge him for ice time. A trade similar to the one Buffalo made to acquire Mikael Tellqvist in 2008-09 seems like the route the Blueshirts will take. The only other feasible options for Enroth, in my opinion, were the Stars and Ducks. Both the Stars and Ducks have endured their respective goaltending problems this season and could definitely find value in acquiring a goaltender who could slot in as a 1B when he’s playing well. Even if both the Ducks and Stars were interested, I find it hard to imagine that Murray would have been able to rake either team over the coals for Enroth. With that taken into consideration, netting an extra draft pick for a goalie who was likely not part of the team’s future plans seems like a good decision on Murray’s part. Not to mention there is the possibility of Murray signing Enroth as a free agent this summer. Obtaining another asset, as minimal as it may be, was the right decision in this case. I’ve never seen Enroth as a true long-term solution for the Sabres. At his best he represents a strong 1B on a team looking to run a tandem in net. He’s been prone to lengthy cold spells and that just simply not something I was keen on seeing in the Sabres crease going forward. The 2014-15 season is obviously tough to gauge as Enroth has been stuck behind a historically bad defensive team, but even this year has featured 1-8-1 and 1-13-1 droughts. On another horrific possession and defensive squad in 13-14, he went 1-12-5 before registering his second win of the season. Perhaps the most telling streak came in 2011-12 when Enroth took over for Ryan Miller after he was injured against the Bruins. In his 20 games to end the year (after Miller’s injury), Enroth went 3-11-4 with a 3.23 GAA and .904 SV%. While he was a few years younger, the performance also came behind a better team compared to the two he’s played behind this year and last. Enroth has just never been a goaltender who struck me as the answer for the Sabres. He does some things well and his improvement in the shootout this season was quite promising. However, he’s never shown the ability to really take the reigns and run with them, at least not in Buffalo. Even if he hadn’t been traded this season, I wouldn’t have been surprised to see Murray look elsewhere on the open market this summer. 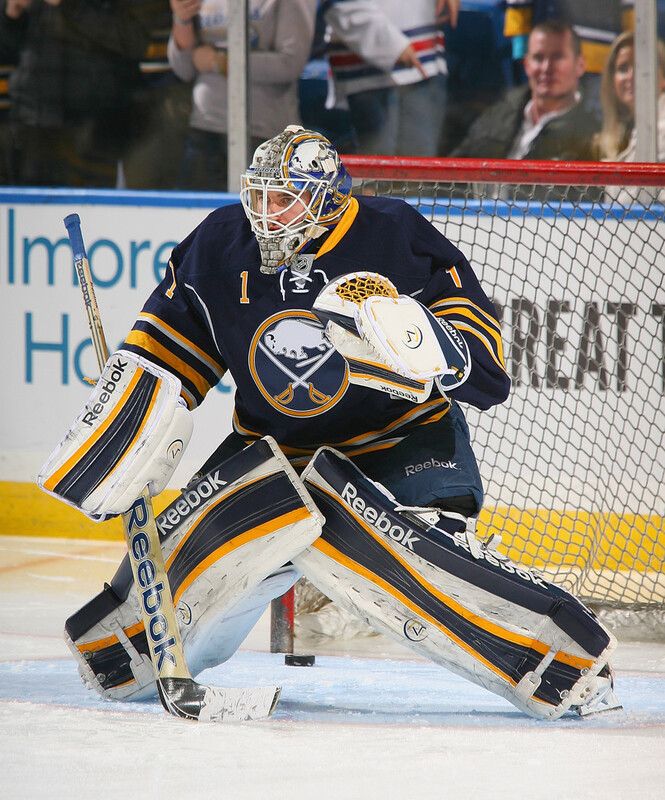 Moving Enroth does leave a sizeable gap in the Sabres’ roster. While Murray likely has interest in seeing Neuvirth return to form, I find it hard to believe he has much more to offer than what’s been seen this season. Lindback is nothing more than a seat warmer at this point and he’ll probably be back in Europe next year. Acquiring Jason Kasdorf was an interesting decision not because he could potentially see minutes in Buffalo next year, but because he adds another body to a part of the pipeline that could potentially lose two prospects this summer. Both Matt Hackett and Nathan Lieuwen are set to become restricted free agents in July with Hackett holding a clause that would make him unrestricted if he doesn’t reach a certain plateau in games played. By acquiring Lindback it would appear the Sabres don’t plan on seeing him reach that threshold. Combine that with Lieuwen’s health issues and it’s safe to assume that both Hackett and Lieuwen could be looking for work elsewhere next season while Andrey Makarov and Linus Ullmark man the crease in Rochester. Kasdorf will join Jonas Johnasson and Cal Petersen in the pipeline as unsigned prospects with the potential to push for a contract as early as the spring of 2016. This still leaves the Sabres with a major question mark in goal entering the 2015-16 season. The free agent market is weak and trading for a goalie will be no easy feat. However, given the desire to get as much return for expiring assets as possible – particularly those who likely don’t factor into Buffalo’s future plans – I cannot fault Murray for deciding to move Enroth at this time. The picture in goal may be fuzzy now, but there is plenty of time for Murray to circle back around to strengthening the Sabres in the crease.